There is no doubt that performing consistent physical activity has positive effects on your health. Along with lowering your risk for certain diseases and health conditions, physical activity helps you reduce body fat or maintain a healthy body weight. If you are an outdoor enthusiast, try hiking or running to burn hundreds of calories per hour and blast fat from your body. Consult your doctor before beginning any kind of fitness regimen. Whether hiking on a mountain trail or along flat country paths, you can burn hundreds of calories per hour. 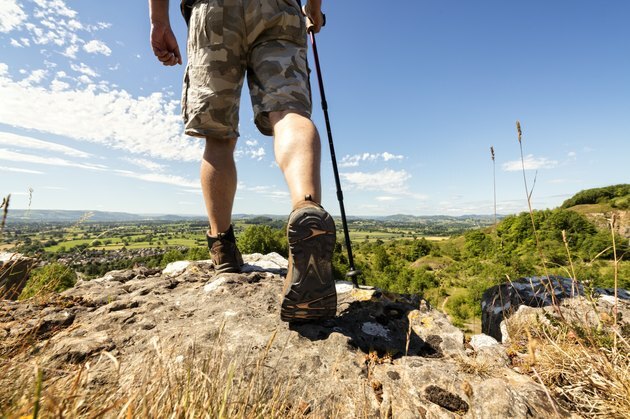 Hiking burns nearly 532 calories in an hour for a 185 pound person according to Harvard Health. Cross-country hiking -- hiking on various kinds of terrain -- burns approximately 490 calories per hour if you weigh 180 pounds, according to the NutriStrategy website. Backpacking is a form of hiking in which you carry a backpack full of supplies or other necessities. Backpacking is often part of cross-country hiking or hiking for long durations. NutriStrategy calculates that a 180 pound person burns more than 570 calories per hour backpacking, and a 205 pound person burns more than 650. Running at a moderate pace often burns more calories than hiking. A 180 pound person burns more than 650 calories per hour running at a pace of 5 mph. If you weigh 205 pounds, you can burn almost 750 calories an hour running at the same pace. Increase the speed slightly to 6 mph and a 180 pound person can burn more than 800 calories and a 205 pound person can burn more than 930 in an hour. Running at a vigorous pace can help you burn more than 1,000 calories per hour. A 180 pound person burns more than 1,100 calories an hour running 8 mph, or more than 1,300 calories at a pace of 10 mph. A 205 pound person burns more than 1,250 calories at 8 mph and nearly 1,500 calories at 10 mph.